“Money and banking are far too important a business to be left to politicians alone.” So said Major Clifford Douglas, the founder of Social Credit. In the 1930s this engineer and self-taught economist claimed that society was intellectually hypnotized and that only a drastic de-hypnotization and re-education could save it. Douglas believed in people. He felt that individuals had far more goodness and potential than society was allowing them for. He reckoned that if common folk were given enough freedom and leadership they could move society and civilization into a new age. An age of extended liberty, discovery, art and culture.The alternative he felt would be booms, busts, over-consumption, under-consumption, excesses, depressions and wars. Eighty years later this is exactly what the world has experienced and is continuing to experience. However, the period between each stage is narrowing and the level of debt, instability and inequality are exploding beyond comprehension. To the Social Credit followers of Douglas this situation is not happening by accident; it is happening inevitably because the conceptual flaw in the banking system which he identified has been allowed to perpetuate by a privileged banking class. We must re-engineer money if we wish to prevent the current inevitable cycle of boom, bust and war.The only way Douglas’s solution can be implemented is if each and every one of us takes personal responsibility to understand what Social Credit is and spread the word. 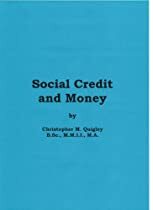 This slim collection of 5 essays will helps explain to you, in simple language that you can understand, the essence of Social Credit. I have also included some material to help you understand the difference between real and fiat money. Mr. Quigley was born in 1958 in Dublin, Ireland. He holds a Bachelor Degree in Accounting and Management from Trinity College Dublin and is a graduate of the Marketing Institute of Ireland. Since 2007 Mr. Quigley has written over 90 articles which have been published on popular web sites based in California, New York, London and Dublin.